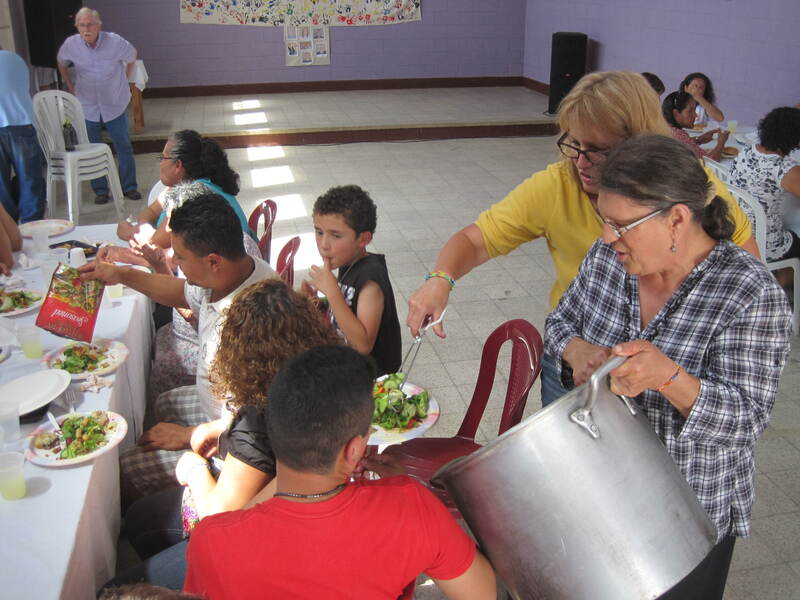 Vicki and Peggy serve a community meal in Tierra Nueva I.
Vicki Schmidt participated in a delegation from Faith Lutheran/Journey in Faith to visit their sister community in Tierra Nueva I in June of 2013. She shares the following reflection. Tierra Nueva Uno (New Land 1), located in Chinautla, Guatemala, is an hermanamiento (Sister Parish linkage) with Faith Lutheran/Journey in Faith, West Fargo, ND. Our relationship began in 2001, and encounters with each other, both in the South and North, have moved us from the superficial to loving friendships that we all treasure deeply in our hearts. 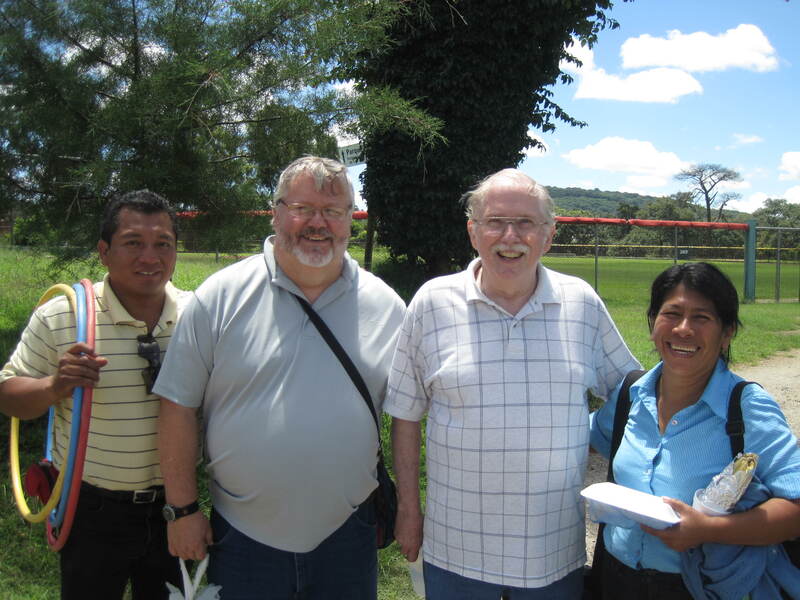 In June of 2014 I was graciously received by the family of Isidro and Aura, in their comfortable, modest home. We struggled with communication but they endeared themselves to me and my roommate very quickly. We felt drawn into each others’ lives and easily felt at home with them and their children. We slept in Isidro and Aura’s bed while they slept on a mat on the living room floor. This gesture of hospitality was difficult for us to receive but we felt their love displayed to us by this sacrifice on our behalf. One morning I was standing in conversation with Aura when she circled behind me and began to massage my shoulders and back. Though it surprised me, I relaxed, savoring the warm gesture. After a few moments Aura reached for a chair and directed me to sit down. She continued skillfully working muscles in my upper back and neck with her thumbs and strong hands. Then she turned and motioned with her hand for me to remain in the chair. I heard splashing water at the pila, and in a moment she was back with a basin of water, placed it on the floor at my feet, and kneeled down. She lifted one of my feet and carefully placed it in warm water and began to massage each muscle, each toe. Seamlessly she took my other foot and after washing it, began caring for it as for my other foot. Having anyone touch my feet is uncomfortable, and such discomfort immediately arose inside me when Aura began her miniseries. But something changed. When I looked down at Aura’s hands rhythmically pressing and kneading my sore muscles with such gentle care and love, she looked up at me, and I found myself looking into the face of Jesus, into the eyes of the Servant Christ. It was Jesus offering me release from my cares, my aches, my pain, and inviting me to accept this love without condition or justification. It was Jesus, through Aura’s holy touch, that would lift me from that place invigorated and healed. I was freed to rest into the beauty of the moment and see the Spirit’s caring action in my life. Friends from North Dakota and Tierra Nueva I.
I have learned from my sisters and brothers in our sister parish relationship what it means to live in poverty. We often allow someone’s lack of material goods to define them as poor. There is a difference between material poverty and spiritual poverty. I have discovered from many who are materially poor, that they have spiritual richness beyond what I encounter in my daily life in a culture of consumerism and success. The poverty is often my own as I let material bounty crowd out my spirituality. That day I was given insight to know God’s grace in full measure, as Aura kneeled at my feet and massaged new life into my weary body. She gave me a spiritual gift beyond measure, from a pure heart and gracious spirit, and with divine love. This entry was posted in Delegations, General, Guatemala and tagged delegate reflections, delegations, Faith Lutheran, tierra nueva i, vicki. Bookmark the permalink.